There's a great debate into Metal scene worldwide, about bands with Christian lyrics. Some are against this way, others are favorable, and the ones like me that couldn't care less in the end of things. I personally believe that freedom of speech is a conquest that many gave their lives to reach, so, you can like it or dislike it, but everyone has the right to express on the lyrics what they want. And it's a matter of justice to say when a band is doing a good work or not with satanic or Christian lyrics. 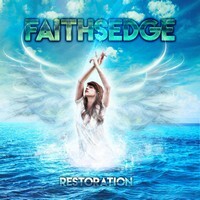 So, now we can talk about the good work from North American quintet FAITHSEDGE that is coming with their new album, "Restoration". They are a Heavy Metal band with hooking melodies and a good musical weight on their songs. But in some moments, we can feel a strong Progressive Metal influence, in the moments when they use broken tempos and a more technical insight. But they have a musical inclination to a melodic weight, with that dose of aggressiveness that we all know that the USA Metal School has. And their work is truly good! Alessandro Del Vecchio, the band's keyboardist, is the album's producer, and he did a fine work. The album has a good level of sound clearness that allow us all to understand what they are playing and what they want to do. On the other hand, the instrumental tunes are very good, giving their musical work the needed amount of weight. Their songs are all excellent pieces, but their finest moments are the thunderous and lovely melodies of "Never a Day" (great work from vocals and guitars, because both are reaching our hearts instantaneously, and an excellent chorus is presented) and "Jennifer" (again the use of hooking guitar riffs and excellent chorus, besides the song tempos are not so fast as the previous song), the bitter weight of bass guitar and drums on "Her Way Back" (as well as their technique), the lovely tempos and harmonies of "Regret at All" (it has a touch of old Hard Rock on it, with excellent guitar riffs and solos), the hooking and introspective work of vocals and guitars on "Let You Breathe" (that gains some aggressiveness at a part until it's end), and the Hard N’ Heavy scent shown on "This is Everything". Their musical work is truly excellent, besides it's nothing truly new.